Now the third-largest sporting event in the world, the Paralympic Games were first held in Rome, Italy in 1960 and featured 400 athletes from 23 countries. Highlighted here are three Spartans who are part of the Paralympic movement, promoting its values of enabling and empowering athletes while challenging stereotypes and transforming attitudes about athletes with impairments. Dawna (Moody) Callahan, ’02 MS Recreation Management, has long known that she wanted to be an advocate for recreational programs that benefit people with disabilities. Having contracted transverse myelitis in 1972 when she was three, she has been a wheelchair user ever since. 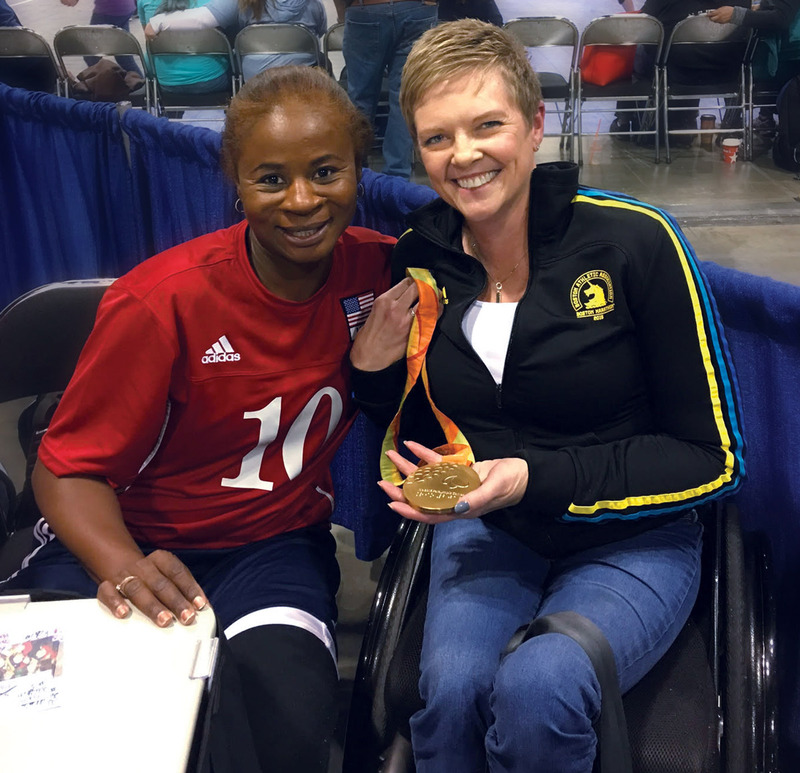 Dawna (Moody) Callahan (right) holds 3x Paralympian Kari Miller’s (left) gold medal from the 2016 Rio Paralympics. But that has never slowed her down. The director of programs for the Challenged Athletes Foundation, Callahan is part of a movement designed to provide empowerment, awareness and mentoring to athletes with physical challenges. From 2008 to 2014, she worked with the U.S. Paralympics, a division of the United States Olympic Committee. Callahan’s father’s cycling club built her a hand-cycle when she was seven. During high school, she was active integrating into regular physical education classes while overcoming scoliosis surgery that delayed college for a year. Despite her disability, she finished the Boston Marathon four times along with numerous wheelchair and road races across the country. She also skis. This past September, she was in Rio with the Challenged Athletes Foundation for the Paralympic Games, which provided 44 percent of Team USA members with funding at some point during their athletic endeavors. Beyond the funding now available to athletes, Callahan says the Games have slowly but surely garnered more attention. “We still have a long way to go because people confuse Paralympics with Special Olympics, but the Paralympics in Rio got a lot of prime-time coverage,” she says. The Paralympics feature athletes from six main disability categories that meet certain qualifying standards, whereas the Special Olympics welcomes all athletes (age eight and above) with intellectual disabilities. As a two-time Paralympian looking ahead to the 2020 games in Tokyo, Steven Toyoji, ’15 MA Child and Adolescent Development, still recalls the roar of 90,000 spectators during the opening ceremonies at the 2008 Beijing Paralympics. Steven Toyoji at the 2008 Beijing Paralympics. Toyoji, manager of adaptive and veterans programs at the Reikes Center—a Paralympic sport club in Menlo Park—has also represented the U.S. Paralympic track and field team at European and world championships. He had hoped to compete in the 2012 Paralympics in London, but a femur injury in 2011 derailed those plans. He placed fifth in the marathon and seventh in the 400 meters in Beijing, and took fifth in the 1,500 meters in the Rio Paralympics. And the 31-year-old says he is not done yet. “We went on family vacations where we rode horses, played tennis, swam and skied,” he says. At age 16, when his friends began playing sports for their school or club teams, Toyoji took up wheelchair basketball through Seattle Adaptive Sports. “I was reluctant at first to participate in an ‘adaptive’ sport because I always had fun just running around with my peers, but when I had the added mobility of a basketball chair or the speed of my racing chair, it was a complete game-changer,” he says. 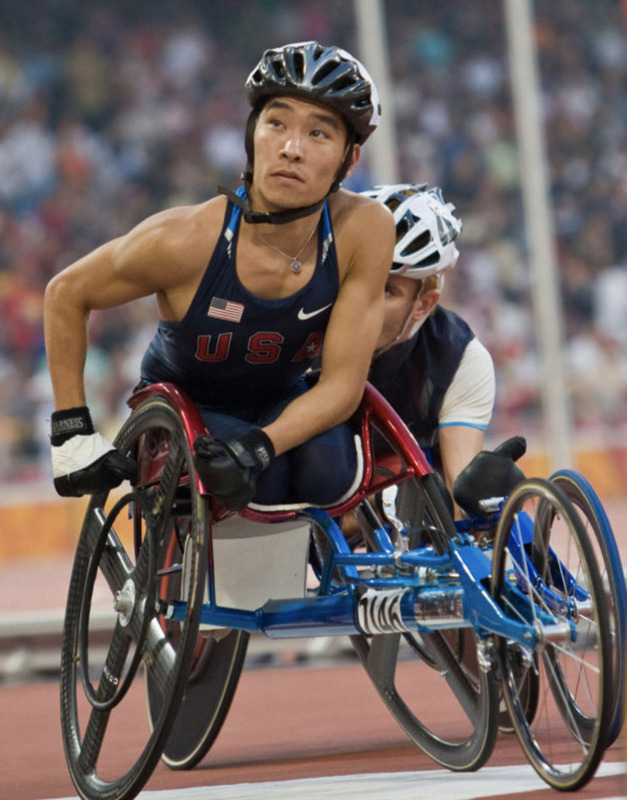 Toyoji’s abilities earned him athletic and academic scholarships to the University of Arizona, where he competed for the wheelchair basketball and wheelchair track and road-racing teams, while earning a bachelor’s degree in business administration and marketing. During college, he began entering international wheelchair racing competitions in the 400-, 800- and 1,600-meters along with 10K and 12K races, and made his first Paralympic team. Monica Bascio, ’98 Occupational Therapy, grew up watching her brothers play sports and dabbled in recreational leagues herself, but she didn’t know the depths of her competitiveness until she was forced to rehab from a 1992 skiing accident that left her paralyzed from the waist down. 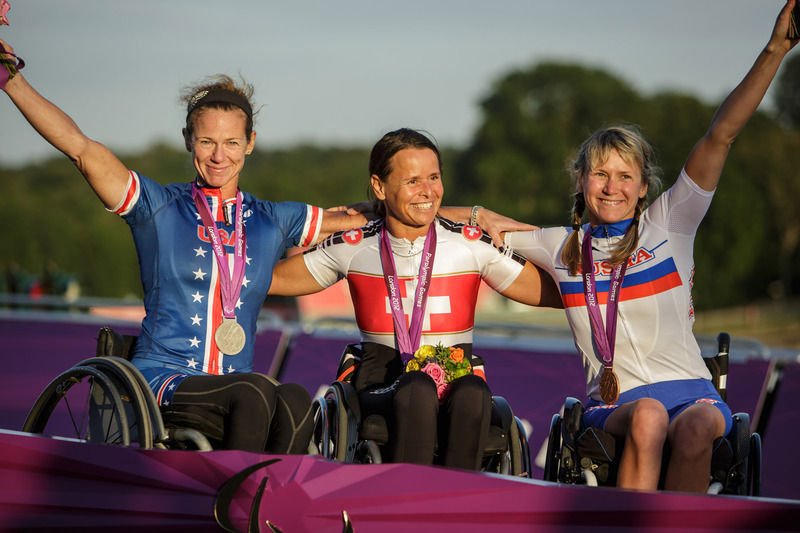 Monica Bascio (left) won the silver medal at London’s 2012 Paralympics games for the women’s individual h3 time trial. Switzerland’s Sandra Graf (center) won the gold with Russia’s Svetlana Moshkovich (right) winning the bronze medal. That newfound drive led her to become a five-time para-cycling world champion and a two-time silver medalist at the 2012 London Paralympic Games. She also participated in three sit-skiing events at the 2014 Paralympics in Sochi, Russia and in 2016 was one of nine athletes named to the International Paralympic Committee Athletes’ Council. In 1998, Bascio placed second in the Handcycling National Championship and went on to win multiple national titles over the next five years. After she and her husband moved to Colorado in 2002, she continued para-cycling and got into cross-country sit-skiing to maintain her endurance during the winter. She won a silver medal at her first international sit-skiing event and made the U.S. National Team in 2004, placing fifth in the 10K and fourth in the spring biathlon in the 2006 Paralympic Games in Torino, Italy. Special thanks to Monica Bascio and SJSU alumnus Chuck Dougherty for helping us tell this story. Some of our best story ideas come from WSQ readers!